Raskin’s project utilizes representations of the individuals whom she considers to be some of the most significant players of the Cold War – Joseph Stalin, Henry Kissinger, and Harry S. Truman. (The latter, the American President responsible for authorizing the use of nuclear weapons against Japan and creating the Department of Defense, is represented by a gigantic nuclear powered aircraft carrier named in his memory.) Her original concept proposed that the person of Henry Kissinger, accompanied by a collection of salvaged Stalin statues, sail around the world until the nuclear power stores on the SS. Truman are exhausted. Raskin’s unlikely proposal engages the complementary ideological registers of American Exceptionalism (a phrase originally coined by Stalin himself to characterize US working-class complacency) and Post-Soviet Cynicism (engendered when the Soviet critique of US neoliberalism rapidly gave way to the rise of Russian oligarchy). 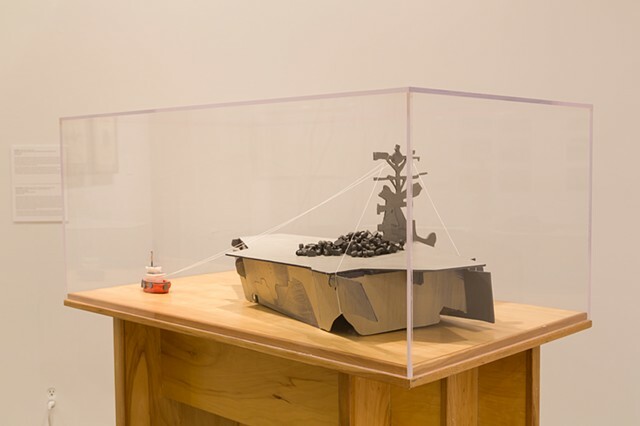 In an gesture toward identifying an inherent problem of public sculpture—the chronic oversimplification of ideas in an effort to appeal to the widest publics—the piece resembles an attempted, playful tableau from a child’s playroom or craft project.